The Azawakh breed is characterized by a unique appearance that combines a disproportionate body, head and legs with an air of grace and swiftness. These tall dogs stand with hindquarters that are higher than their shoulders and have a deep-set chest. With a very small stomach area, this breed is thin and has an easily seen skeletal structure. Their very short fur almost always features white markings as this breed was selectively bred to include this attribute. 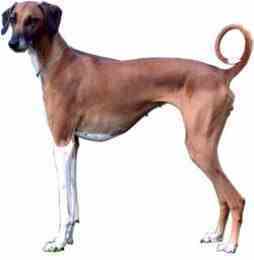 The Azawakh breed has tails that hang down with a small curl at the end and a practically hairless belly. They were originally used in Mali for hunting and protection as they are often wary with strangers and even aggressive. However, these dogs will be affectionate and gentle to those they know and are even playful with owners. With protective instincts and an alert nature, the Azawakh dogs will gather together with their pack and chase away danger if they feel threatened. This breed makes an excellent guard and watch dog thanks to their intelligence, light-footed build and caution toward strangers. Owners of Azawakhs love the breed! These dogs make exceptional guard dogs but remain gentle and affectionate toward their family. They are playful and friendly with people they know. On the other hand, they will be suspicious and have been known to show aggression toward strangers. Combined with their natural intelligence and protective instincts, this makes them alert watch dogs. The Azawakh breed is proud, haughty and does not enjoy harsh punishment which should never be used toward these dogs. They consider themselves as equals to their owners and should be properly exercised or trained to prevent them from becoming food thieves and possibly obese. This breed does better in warm climates and loves the sun – in their native country, they are often found dozing on straw rooftops. However, they spring to action when danger comes by gathering in a pack to chase and ward off the threat. Sporting a thin coat, the Azawakh breed is easy to care for. They require a simple rub down once in a while to maintain their thin coat. This breed may have health concerns including seizures, hip dysplasia, spondylosis, hypothyroidism and cardiac problems. They can also be afflicted with the most common health issue to all dogs – bloat. Also known as gastric torsion or twisted stomach, this occurs when a dog eats too much too fast. Azawakh dogs require daily exercise. These dogs enjoy long walks and the ability to run off-leash as they need anywhere from a regular to high amount of exercise. They can be exercised at about the same time each day since they do well with schedules. This breed features a natural tendency to guard and does best with a firm, even-tempered owner. Owners should establish themselves as the calm, confident and consistent pack leader. Ensuring that a natural yet gentle authority is displayed over the Azawakh dogs will result in the best training.